Hell Teacher Nube 0 a.m. follows the life of the new transfer student named Jun who has this fascination with clowns. At the start of the film, Jun gazes at his mirror which contains his clown friend often referred to as "Pierrot-Kun" (French for Clown). Pierrot claims to be his friend although he's only manipulating Jun for his freedom from the mirror. The movie begins much like the set of a horror film building on tension & atmosphere with the occasional angle shots to further emphasize the horror tone. Jun gets bullied which forces him to seek trust in Pierrot and in return assures Jun that everything will be alright as he'll deliver payback to those who done him wrong. 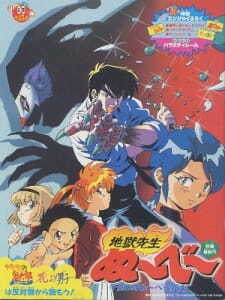 Unlike the first film, Nube has more of a role in 0 a.m. as the 2nd half of the movie is from his point of view where he battles Pierrot to rescue his students. 0 a.m. delivers on some action & B movie qualities as we are dealing with a demonic clown & certain clown themed weaponry. Overall this movie feels what a Nube should be with its blend of horror & comedy & the occasional heroic antics of Nube. Not much to say other than it feels like an alright horror film, far from being the scariest thing you'll see but certainly has this charm to it especially for fans of the anime.